Why the alt-right is wrong on immigration. While there is no strict definition of what the alt-right constitutes as a movement and ideology, it seems by in large composed of people who promote (to varying degrees) ethnocentrism, nationalism, right-wing populism, and nativism. Seemingly, the public policy issue which the American alt-right principally concerned with is immigration. The alt-right portrays America as a country whose borders are wide open, with illegal (and legal) immigrants flooding the country, taking jobs which supposedly belong to Americans, taking huge sums of money from American taxpayers in the form of welfare, and changing the cultural and political landscape in a way which will supposedly destroy America as we know it. However, whilst the rhetoric of the alt-right may be persuasive to some, it is frequently based on apocalyptic exaggerations rather than actual data. For example, the most common justification for supporting Donald Trump coming from these people is that illegal Mexican immigrants (and legal ones too) are enormous threats to liberty and that our very civilization and way of live are currently at stake. Drastic times call for drastic measures, after all, and we can’t have millions of immigrants flooding across our open border, stealing our jobs, taking welfare, and destroying our culture, right? Well, not exactly. The fact that Donald Trump and the alt-right never mention is that, after rising during previous decades, the illegal Mexican immigrant population in the United States has actually declined from its peak of 6.9 million in 2007 to 5.6 million in 2014, the latest year for which Pew Research reports data. 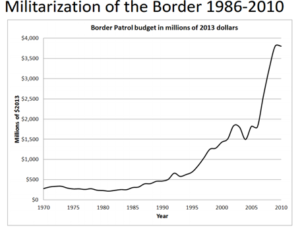 Moreover, just because America doesn’t have a wall which covers its entire Southern border doesn’t mean it has “open borders.” The reality, according to the data, is that the Southern border is more militarized and guarded in recent history than it ever has been in the past. 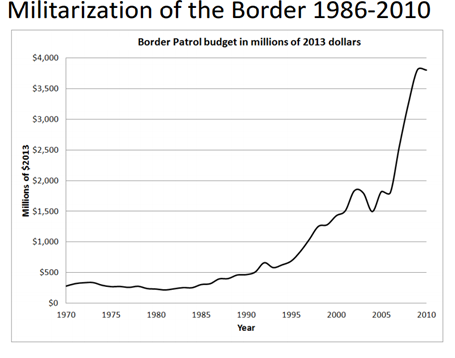 Consider that the Border Patrol Budget more than tripled, from under $10 billion in 1995 to over $35 billion in 2010. According to these authors, this occurred because increased border enforcement had no impact on the probability of a successful journey across the US-Mexico border, but it did make the trip more expensive and consequently reduced the likelihood of undocumented workers returning to Mexico. The fact that increased border enforcement completely backfired leaves open the very real possibility that Donald Trump’s border wall, if it ever came to fruition, would backfire as well. Many on the alt-right aren’t just concerned with illegal immigration, but immigration altogether. They tell us that immigrants steal our jobs whilst paradoxically and simultaneously lazing around on welfare, and that they vote in favor of economic statism. If we don’t cut down on legal immigration, we will inevitably find ourselves living in a socialist country. There is widespread acceptance that an influx of immigrants necessarily leads to less jobs and lower wages for natives. But the reality is that there is little evidence that immigrants reduce native jobs or wages. According to economist Giovanni Peri, the data shows that immigrants tend to increase specialization in the economy, contributing to higher levels of productivity. That is, immigrants’ skills tend to complement those of native workers. They also increase demand for domestically produced goods and services. As a result, on net, real wages of natives tend to increase in response to immigration. Natives aren’t even necessarily harmed by large influxes of low-skilled workers. In a now famous paper, David Card found that an influx of Cuban migrants in Miami, which raised the population of the labor force by 7 percent, had no effect on native low-skilled workers. Similarly, in a paper published by the National Bureau of Economic Research, Adriana Kugler and Mutlu Yuksel found that large influxes of low-skilled Latin American immigrants as a result of fleeing Hurricane Mitch lead to no negative impact on American jobs or wages. In 1996, the federal government cut off incoming immigrants to federal transfer programs for the first five years of their stay in the country. However, a number of state government restored those benefits to immigrants. Using this variation in state-level policy as a means to see if immigrants were attracted to a given location as a result of welfare benefit generosity and eligibility, Neeraj Kaushal of Columbia University found that there was little evidence that this was the case. Other research has come to similar conclusions. On a related note, scholars from the Cato Institute and George Mason University examined how the share of the foreign-born (and undocumented immigrant) population influenced “a variety of measures for welfare and related public spending such as K-12 education, Medicaid, and unemployment insurance,” in the United States from 1970-2010. A related fear is that legal immigrants will vote for Democrats, who will expand the size of the state and trample our economic freedoms when in power. 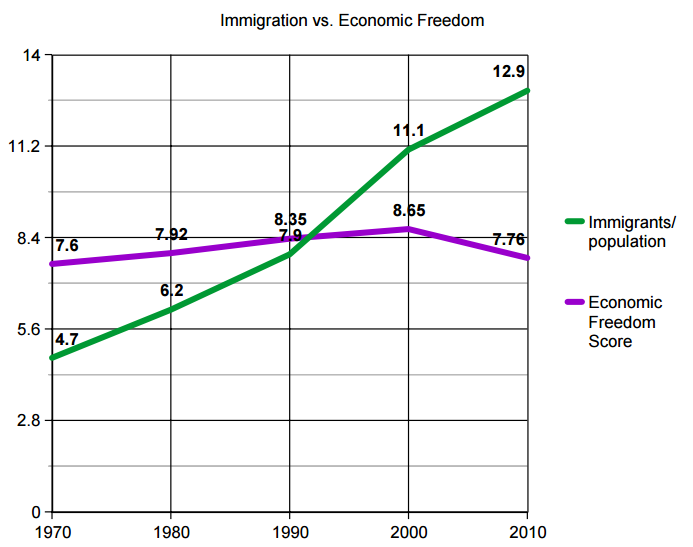 However, the share of immigrants as a percentage of the population has grew rapidly between 1970 and 2010, and there was no commensurate decline in economic freedom. 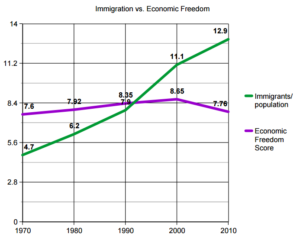 In fact, more in depth research by Alex Nowrasteh has shown that the net effect of immigration on economic freedom in the United States has actually been positive. At the very least, there is no clear evidence that the growth in the foreign-born population has made America a much more unfree place than it was in 1970. In regards to immigration, the rhetoric of the alt-right seems to be more predicated on exaggerating the threat immigrants (both legal and illegal) pose to American society than seemingly anything else. The evidence suggests that immigrants aren’t welfare magnets, they don’t steal our jobs, nor are they the overall inevitable harbingers of doom for civil society that some on the alt-right portray them to be. The very premise of the raison d’etre of the alt right itself is wrong. What public policy issue are they more concerned with than immigration? You blow my mind with every post you write, and that passage alone made me even more anti-alt-right than I already was!